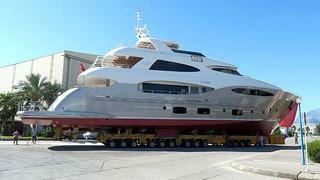 Following the recent deliveries of the Vulcan 46m and the Vulcan 32m, Vicem announces the launch of a third hull in this series, the Vulcan 35m motor yacht christened Julem I. Built in composite and designed by Frank Mulder like her previous sisters, this new 38.38m RINA classed semi-displacement motor yacht offers large volume for her size. The interior, designed by Art-Line, accommodates 12 guests in six cabins. Two full-beam masters are on the bridge deck and the main deck. The other guest cabins are on the lower deck, including a full-beam VIP, two doubles and two twins. Powered by twin 1,490kW MTU engines, Julem I achieves a top speed of 20 knots, a cruising speed of 16 knots and a range of 1,200 nautical miles at 12 knots. Julem I will be delivered later this year.